injury is trauma to a group of muscles and tendons found in the shoulder area. The function of this group of muscles is to firmly hold the head of the upper arm bone to the socket of the shoulder. This is common to people who are likely to require overhead motions of the shoulder such as badminton players, carpenters and other construction jobs, and painters. It may also develop because of falling, repetitive stress, and lifting or pulling. The risk of developing rotator cuff injury also increases with age as muscles tend to wear as years go by. The characteristic manifestation of shoulder injury is a dull aching shoulder pain that is aggravated by pressure on the affected area such as sleeping on the involved site or movement of it. It can greatly reduce an individual’s quality of life. For diagnosis, physical assessment as well as various imaging scans will be used such as x-rays, CT scan, and magnetic resonance imaging (MRI). Usual treatment is surgery. Over the years, surgery did not increase healing rate of rotator cuff injuries and so most of the time, it leads to permanent occupational disability. Hence, a team of researchers from Milan, Italy unravelled a new alternative to treating rotating cuff injuries without necessarily breaking through the skin. The study entitled,” Regenerative Medicine in Rotator Cuff Injuries” was conducted and led by Pietro Randelli. The study was published in BioMed Research International on August 2014. Basically, the study revolved around the utilization of tissue-engineering strategies which ‘involve the use of cells and/or bioactive factors to promote tendon regeneration via natural processes.’ These tissue-engineering strategies referred to are the use of platelet-rich plasma (PRP), growth factors, and stem cell. Growth factors are molecules actively involved in cell growth during inflammatory process. Since rotator cuff healing undergoes inflammation phase, growth factors can help in healing through tissue growth while degrading dead tissues. On the other hand, PRP is a plasma concentration with high platelet volume and provides growth factors. Lastly, stem cells are basically, unspecialized cells that can be manipulated to become any specific cell. 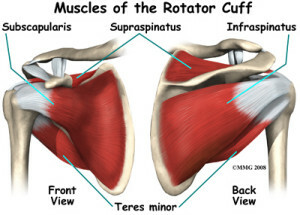 This can replace damaged cells in the rotator cuff injury site. Efficacy of growth factors to treat rotator cuff injuries was analyzed through in vitro and animal models. It showed hopeful results. A follow-up study for its effectiveness of humans is recommended as there is none as of now. Various ways to administer growth factors were examined such as through injections, sutures, and heparin delivery system. 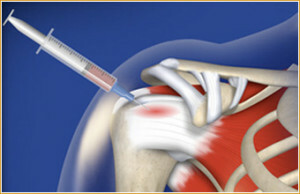 Also, cell-based approach showed positive result in treating rotator cuff injuries. The use of stem cells by injecting it to the site was found safe. However, researchers recommended conducting additional studies about the use of stem cells in treating rotator cuff injuries to further explore the subject matter and as well as contribute to the advancement of sports medicine. If you have shoulder pain or have been told you need surgery, contact our sports medicine specialists at Orthopedic Surgery San Diego today for an evaluation.